For many European companies, China is still the most interesting export market worldwide. The internet has also become an indispensable tool for sales, service and marketing in the Middle Kingdom. Until a few years ago, internet was mainly accessible in big cities. Nowadays it is available almost everywhere. The number of internet users has grown from 80 million in 2003 to more than 600 million in 2013. Overcome the language barriers: Even though many Chinese, especially the young generation, have good or not so good command of English, a European company should provide an adapted website in Chinese language in any case. 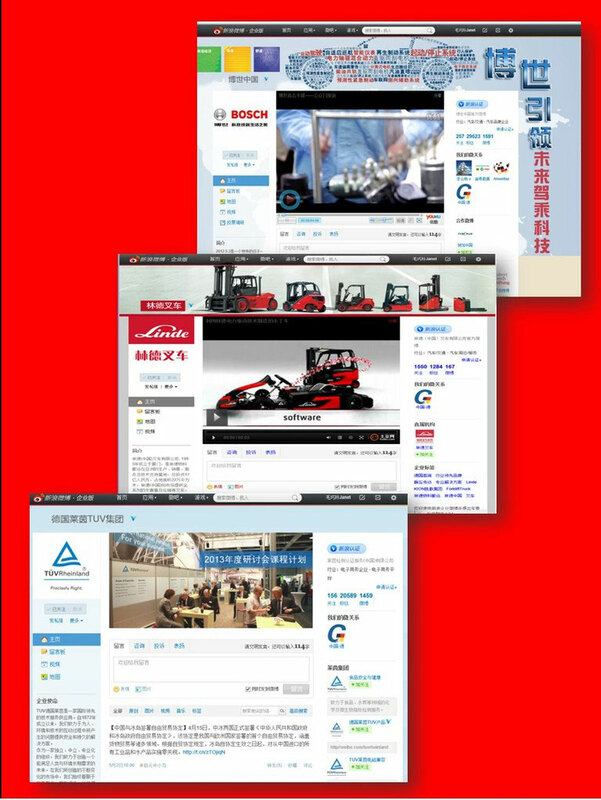 Adapted contents: The content of the website should be adapted according to the marketing strategy for China and relevant for the Chinese customers. It should not be just a one-to-one translation. This can be ideally done by specialists equipped with a good understanding of the Chinese way of thinking as well as know-how in marketing and content design. This also applies to other company presentations, advertisements, business cards, etc. Design: Chinese is a visual language due to the picture-like characters. The language has a strong influence on the Chinese way of interpretation. Therefore a Chinese website should present more information in pictures than texts. Censor: China’s cyber world is guarded by an invisible “Great Firewall”. Websites are permanently monitored by the state. Website owners should beware that no sensitive words, terms or names should be published on their sites, otherwise they could be blocked within China. Contents of blogs, news, readers’ comments etc. must also be controlled carefully. Availability: To ensure the availability and access speed, the Chinese website should ideally be hosted on a server in China, especially if the site has elaborate contents with graphics, pictures or drawings (e.g. online catalogue). 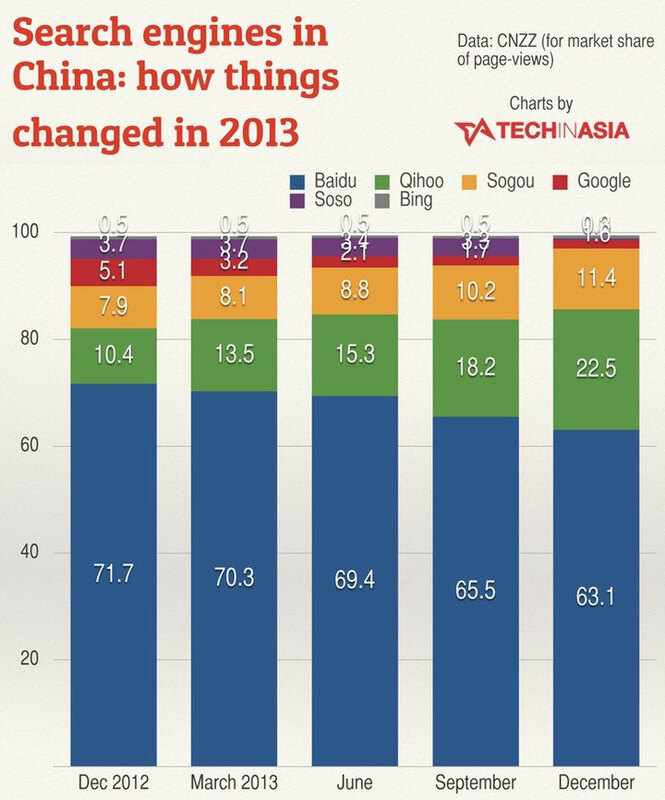 The leading search engine in China is Baidu, with a market share of 63%. 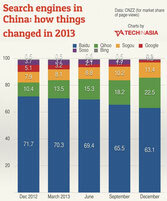 The number 2, Qihoo, has doubled its market share in 2013 (mainly at the expense of Baidu). Sogou is on the third place. On contrary to the West, Google has only 1.6% of the market, due to China’s censorship. Presence is essential. This means to register your URLs in the above search engines. However, the enlisting is not as easy as in the West, e.g. in Google. From our experience, the registration of the URLs (ideally in Chinese language) from Austria or Germany does not work smoothly. Therefore, the registration should be preferably done within China, by a partner with Chinese language skills. Despite the low market share, Google should not be ignored by European companies. The most Google users are western oriented people with higher educational levels – who are most likely the potential customers of western companies. Social media are even more important marketing tools in China than in the West. Since major western social media are blocked in the country and the mainstream mass media are mistrusted, domestic social media have become major sources of news and information. Many B2B companies use social media to communicate with (potential) customers, (future) employees and other stakeholders in society. The most popular social media in China are e.g. Sina Weibo and the up and coming WeChat. As for websites and search engines, the set up and maintenance of social media channels should be done by competent employees or external specialists. The protection of brand names is especially important in China. Careless email correspondence (e.g. with an office address) or assignments to unknown service providers in China could have unpleasant consequences. Westerners are often shocked, when they find out the company or brand name they want to register has already been registered by someone else. Due to all these reasons, western companies should cooperate with trustworthy and competent specialists to develop a tailor-made “China-package” in the beginning phase of their manoeuvre into the huge market. The internet is an essential part of the marketing mix. Considering the distinctiveness of the Chinese market, companies should develop a special online marketing plan for the country and implement it consistently – from website, search engine optimisaiton/marketing to social media. Do you have more questions about marketing in China? Please contact us today! Wolfgang Gastner is the co-founder and CTO of Zentron Consulting (www.zentron-consulting.com), specialised in B2B marketing in China. He has more than 20 years of experience in mechanical engineering in China and in Europe.